ALKALIZE OR DIE. This powerful title carries an important message that can benefit everyone-a message destined to revolutionize health care of the future with one simple principle-ALKALIZE YOURSELF! The world is facing the largest health crisis in recorded history. Dr. Baroody's comprehensive research and clinical findings indicate that illness and disease are directly linked to over acidity in the system. The polluted air we breathe, the chemicalized food and water we ingest are part of the problem. Stress on all levels-physical, emotional, mental, and even spiritual cause the body to overproduce acid wastes, upsetting our delicate alkaline/acid balance. By following the guidelines in this book you can evaluate your alkaline/acid situation situation, determine a course of correction, and achieve a high level of vitality and strength. 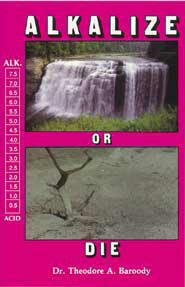 Clear definitions of alkaline and acid. Why hydrochloric acid is good for you and other acids are not. The alkaline needs of glands and organs. The truth about contagious diseases. How to prevent acid-related maladies that accelerate aging. Prepare alkaline-forming meals using the 21 day meal planner. Take nutritional supplements for proper alkaline/acid balance. Use the new "super foods" for building alkalinity. Neutralize any type of stress. THE ALKALINE WAY OF LIFE!